It’s difficult dealing with a dog who has separation anxiety. Unfortunately, many people experience their dog acting out but don’t know it’s anxiety that’s causing their dog to “be bad”. I’ve learned over the years to recognize pretty quickly when a dog might be experiencing separation anxiety but I don’t know much about dealing with it. 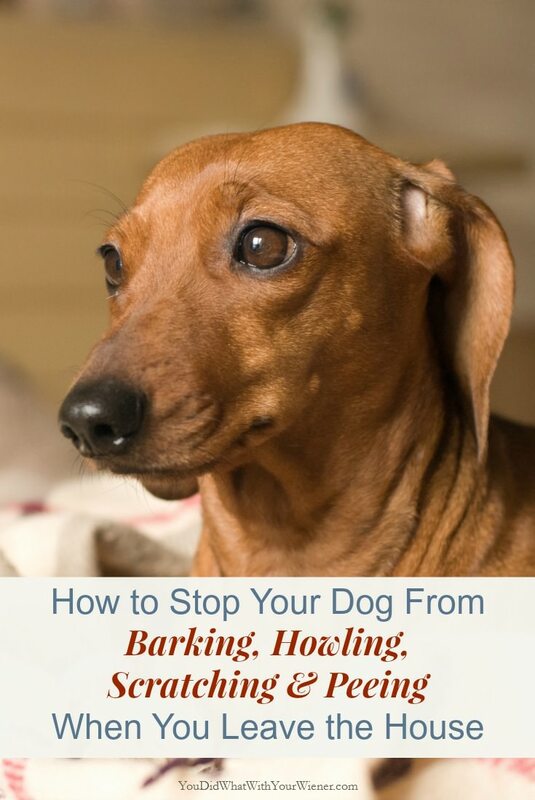 Because it’s a very common issue with dogs, and with Dachshunds in particular, I turned to my friend Tracy for advice. Tracy Krulik, CTC, CSAT is a Certified canine separation anxiety trainer who works with clients remotely so that she is able to help dogs and their families all over the world. She’s the founder and managing editor of iSpeakDog — a website and public awareness campaign to teach dog body language and behavior. An honors graduate of the prestigious Academy for Dog Trainers, Krulik has written for publications including The Bark magazine and The Washington Post. 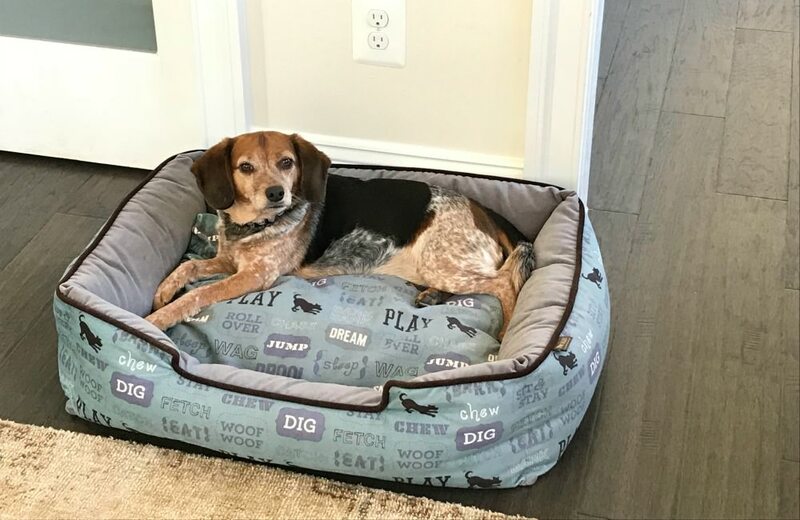 She is an advocate for force-free dog training and loves helping fearful dogs discover confidence and joy — just as she did for her once “fraidy” pup, Emma the Beagle. The barking, the howling, the accidents indoors, the damage to doorframes and window ledges, and even the injuries from dogs trying desperately to get out of their crates—separation anxiety can be devastating to the dogs, the people who live with them, and even the people who live near them. Sadly, Dachshund guardians are no stranger to this problem. In a survey of 1005 Dachshund homes by the website iheartdogs.com, 51 percent of the respondents said their pups suffered from either severe or moderate separation anxiety. How heartbreaking to think that one out of every two Dachshunds could be terrified when left alone. But I have good news: separation anxiety is treatable. I have seen it personally with my own pup, Emma the Beagle, who was petrified if left home alone for 10 seconds, but now has no problem being left alone for four or five hours, and as a certified separation anxiety trainer, I see it every day with my clients. Over the course of our first year with our sweet Emma, my husband and I tried so hard to settle her down when we left her home alone, but we kept failing. We tried waiting for her to stop barking to walk back into the condo, so that she would learn that only keeping quiet would bring us home. We tried leaving her stuffed Kongs, but she wouldn’t eat. We tried teaching Emma to relax in her bed and reward her for staying put. We tried pheromone diffusers, lavender oil, Thunder Shirts, and even therapeutic massages, but none of that helped. In fact, as the year progressed, Emma’s fear got worse. So how did we solve the problem? Desensitization. Separation anxiety is a phobia — no different than a fear of spiders or heights. Just as I shrieked in terror when those big, furry, mini-tarantula-looking monsters ran towards me in my childhood home, dogs with separation anxiety are doing the same. They’re flat out petrified. Without meaning to, moving to a house in the suburbs has helped desensitize me to spiders. When we first got here, there were easily 40 massive dead spiders in the garage. After a week of wishing they would disappear, I accepted that the only way they would leave my sight was if I did something about it. We first had to figure out where Emma’s “fear threshold” was. What is the dividing line between where Emma can stay cool, calm, and collected and where she panics? It turned out that Emma blew a gasket at 10 seconds. For some dogs it’s a few seconds, others it’s five minutes, others it’s 30. Each dog is individual. Because every dog shows fear differently, you have to become somewhat of a master at reading body language to get this right. The clues can be very subtle. At least in the beginning, therefore, I recommend working with a certified trainer to set you down the path correctly. Once we knew where Emma’s threshold was, we did a series of practice absences for about 30 minutes a day — all under that threshold line. Like I had done when I swept dead spiders who couldn’t chase me, we kept Emma feeling safe the whole time. By doing so, we were able to teach Ems that us walking out the door is nothing to fear. Over time we increased how long we were away. By using the video camera, we could watch Emma’s body language to see that, “Wow! I was gone for five minutes, and Emma is totally chill!” And then eventually, 10 minutes, and then 17 minutes, and one day 40 minutes, and another day an hour, and eventually, where we are today: five hours! Have you figured out the catch? Yes. The only way we were finally able to make any progress in helping Emma overcome her fear was to only leave her home alone for as long as she could handle. At first that meant less than 10 seconds. Thankfully, the world is full of wonderful people, and my husband and I were able to build a support network of friends and professional pet sitters who would keep Emma company when we couldn’t be home. Emma is scared around other dogs, so doggie daycare was not an option for us, but for many sep-anx dogs, it’s a great solution. In truth, well before we starting this training, my husband and I had already stopped leaving Emma home alone. It was too painful for all of us. The more people I encounter with sep-anx pups, the more I’m finding that we are not unique. Most of these people are already not leaving their scared dogs alone too. So, the training ends up becoming therapeutic for both the pups and the people who love them. 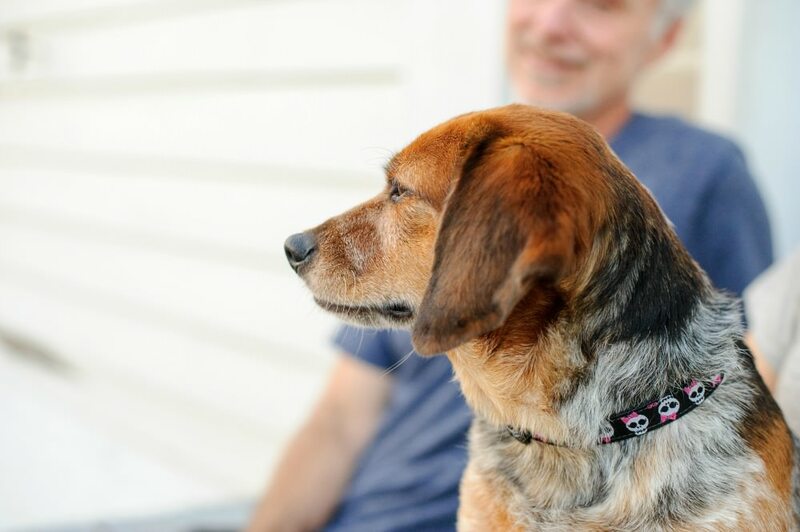 For many dogs — Emma included — anti-anxiety medications can help the process go so much faster. I used to think of meds as a “last case scenario,” and so I fought against using them for Emma. But without them, Emma kept suffering regressions. She’d start to build duration, and then suddenly she would freak out again as if we had never trained her at all. Once we worked with our vet to get Emma on appropriate supplements and medications, though, she started flying through the training. 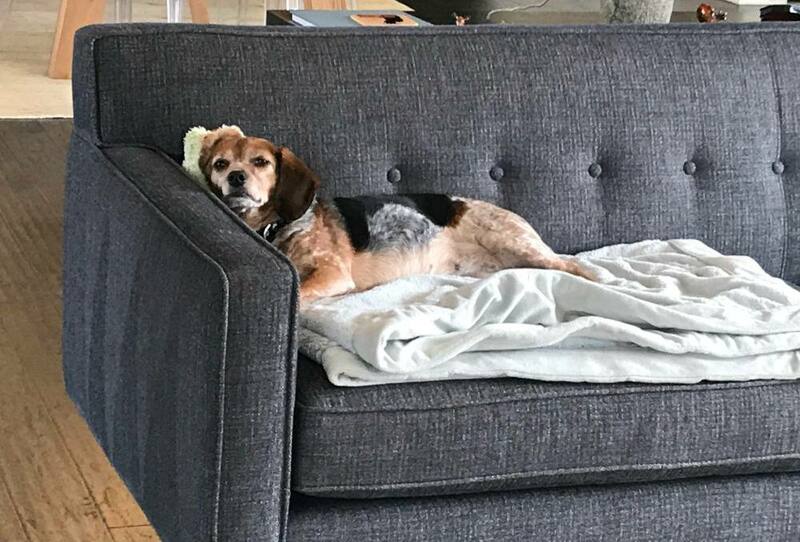 Essentially, with the veterinarian’s help, we washed away the top level of panic that had always been shrouding Emma, so that she could finally relax, think clearly, and learn. The medication on its own will likely not cure a dog’s separation anxiety, but as we saw with Ems, it can sure speed the up the process when paired with training. Before I leave you (pardon the pun), I’d like to share one more thought. If your pup suffers from separation anxiety, I want to lift one burden off of your shoulders: you did not cause your dog’s phobia. This is not your fault. Just like people, dogs have feelings too. And like many of us, some find certain aspects of life really scary. The good news is, thanks to science, we have a tried and true method to help them feel better. If you are interested in complementary 30-minute phone consultation to discuss how the training works, and determine if it’s the right fit for you, please fill out the form at the bottom of this page. We have a 3 year old dachshund that I need to determine if he suffers from separation disorder or anxiety or both. He licks and chews things he should not, other that he is the perfect pet. He does not bark or howls uncontrollably, or pees inside the house (he never did that), so I’m not sure what exactly his issue is, but I need some help for me and us…..